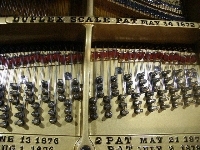 Jamestown Piano Shop uses the finest materials available in the process of piano rebuilding. We aim to stay within the original design of the instrument, making only subtle changes to enhance the piano's tonal appeal according to the wishes of each individual customer. The very best materials are used in the refinishing of all our rebuilt pianos. These include the highest quality lacquers that are hand rubbed to the desired sheen. The piano's plate also receives a new high quality coating using the best acrylic enamels. Hand lettering is performed to match the original specifications and the refinished soundboard receives a new decal. A new custom fit pinblock, new tuning pins and piano strings - all expertly installed - ensures years of future tuning stability and a quality tone often exceeding that of the original instrument design. With our special attention to detail and the passion we possess for quality rebuilding, your piano can receive revitalization that renews the beauty of appearance, the subtleties of a superior touch and a tonal quality worthy of praise from even the most discriminating musician. Though we have rebuilt many pianos and satisfied many discerning customers, we anticipate the opportunity for you to experience first hand the impact Jamestown Piano Shop can have on the life, longevity and value of your instrument.